The Paris Agreement invites individual countries to “formulate and communicate long-term low greenhouse gas emissions development strategies” consistent with the agreement’s global goal of reducing net human greenhouse gas (GHG) emissions to zero by the second half of the 21st century. These long-term strategies (LTSs), also known as Midcentury Strategies (MCSs), generally focus on pathways to 2050 and aim to complement each nation’s nationally determined contributions (NDCs). 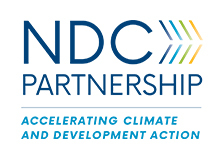 NDCs have a much shorter five-year time horizon and must be updated every five years. In principle, a nation might meet its long-term Paris commitments without an LTS by just stringing together a sequence of short-term NDCs. But such an approach seems unlikely to succeed. Without being part of an envisioned pathway into the longer-term future, a series of short-term steps may prove insufficiently ambitious, may get stuck in blind alleys, and fail to take advantage of unexpectedly promising opportunities. But laying out a credible long-term pathway for sustainable development along with deep GHG emission reductions presents a daunting challenge. With today’s fast-paced and hard-to-predict change any envisioned emissions reduction pathway extending to 2050 is almost sure to rest on predictions that turn out to be wrong. Midcentury is about 30 years away. Three decades ago, there were no websites, no mobile phones, the Soviet Union still existed, and China’s GDP was about the size of Australia’s. The world is likely to change at least as much in the next 30 years as over the last 30. Only a few nations have submitted LTSs, but all of these take steps to grapple with such uncertainty. Some LTSs include some type of scenario analysis. For instance, the United Kingdom’s LTS explores what it calls plausible potential emission reduction pathways to 2050 to help identify low-regret steps common to all of the futures. The U.S. MCS similarly highlights findings robust across three different scenarios. The Czech Republic’s LTS explores eight scenarios, some of which meet the nation’s 2050 goals and some which do not, concluding from this analysis that successful strategies require many different policy measures. Other LTSs consider multiple horizons. For instance, Germany’s LTS has explicit targets for 2030; what it calls guiding principles for 2050; and a process of monitoring, learning, and public dialogue to adjust the plan over time. These LTSs, along with the large body of research on which they are based (Clarke et al. 2014), offer important insights, including one or more visions of how each nation can achieve a prosperous future with no or low GHG emissions. In addition to these future descriptions—representing what analysts call an existence proof (Bankes et al. 2013)—the LTSs also suggest near-term policy actions consistent with these longer-term visions, including the need to pursue a broad portfolio of technology options and the need to include all sectors in any strategy consistent with the Paris goals. But current LTSs rest on scenario methods insufficient to meet the challenges of the Paris Agreement. Beyond providing a vision of how long-term goals might be met, a key purpose of tracing out longer-term pathways is to inform near-term policy choices (Lempert et al. 2003). The scenario methods used in current LTSs do not serve that purpose because they do not sufficiently explore the range of opportunities and dangers that may affect a nation’s ability to reach its longer-term Paris goals, do not suggest means to cushion against adverse shocks or exploit unlikely opportunities, or delve deeply into the connection between pathways to 2050 goals and the near-term policy choices embodied in the NDCs (for a critique of current scenario practice, see Trutnevyte et al. 2016). One need not look far for examples of the challenges facing those developing an LTS. Since the Paris Agreement was signed in 2015, the world has experienced unexpected political developments that have already altered some countries’ commitments to their Paris goals. It is also important to acknowledge, as some LTSs certainly do, that some unexpected developments are welcome because they will make meeting the goals of the Paris Agreement more likely. Three billion people currently live in energy poverty and billions more have trouble affording the energy they do use. Raising living standards and meeting the sustainable development goals while reducing net human GHG emissions to zero represents a daunting challenge, requiring dramatic change in humanity’s energy, transportation, building, agricultural, and other sectors at a rate and scale without historical precedent. Meeting the Paris Agreement goals almost certainly requires what today would be regarded as improbable future changes in behavior, technology, and policy. Current LTSs lack the means to address the multiplicity of plausible futures—in particular adverse developments and advantageous surprises—and to establish an appropriate balance between excessive optimism and excessive caution. Fortunately, LTSs can be augmented with a new approach to longer-term planning that seeks plans that are robust and flexible, designed to adjust over time, and succeed over a wide range of future scenarios (Lempert et al. 2003; Popper et al. 2005). Traditional planning commonly rests on “predict-then-act” thinking, which seeks the single-best strategy based on a best-estimate prediction of how the future will unfold. But prediction-based strategies often prove brittle, failing when the future turns out differently than expected (Weaver et al. 2013; Kalra et al. 2014). In contrast, a new set of approaches called decision-making under deep uncertainty (DMDU) seek robust and flexible strategies designed to perform well over a wide range of plausible futures. Such robust and flexible strategies are designed to succeed even when the future brings surprises (Lempert 2008). The Paris Agreement aims to limit climate change while also contributing to other societal objectives such as those embodied in the Sustainable Development Goals. The decision-support literature calls these multiobjective (or multicriteria) challenges (Keeney and Raiffa 1993), and DMDU methods are designed to identify strategies deemed robust according to multiple objectives, both respecting the heterogeneity of opinion that is a fundamental (and desirable) characteristic of our world as well as enhancing the legitimacy of the planning process by making proposed trade-offs among objectives transparent to all concerned. This focus on transparency—illuminating trade-offs, exploring multiple problem formulations, and facilitating deliberation (Dasgupta et al. 2018)—rather than offering prescriptive solutions, also makes DMDU methods an effective analytic platform for supporting the participatory processes emphasized in several of the current LTSs. The robust and flexible plans that emerge from DMDU generally have three components: (1) an initial plan, (2) signposts to monitor, and (3) contingency actions (Dewar 2002; Haasnoot et al. 2013). The initial plan lays out a sequence of actions intended to achieve decision-makers’ goals. Often the initial plan is chosen to achieve these goals in the best-estimate future. Signposts represent trends that planners monitor to determine if and when they should adjust their plans. Contingency plans are additional actions that would be taken if the signposts are observed. As a simple example related to climate adaptation, a coastal community might as its initial plan retrofit an important infrastructure asset to withstand one meter of sea-level rise. The community would then set signposts related to sea-level-rise projections, in particular evolving understanding of the rate of ice sheet collapse. If this rate stays slow, the initial plan would suffice for the entire 21st century. If the rate accelerates, the community might choose in midcentury to further harden the asset to withstand two meters of sea-level rise. If the worst-case scenario transpires, the community might need to abandon the asset for one further inland by century’s end. The community’s initial plan might usefully include proactive measures to facilitate these future adjustments, perhaps with a flexible engineering design that lowers the cost of any midcentury hardening and obtaining rights (but leasing out for many decades) to land needed for any future relocation. To help identify and evaluate such robust and flexible plans, DMDU methods run simulation models over many thousands or more futures to stress test initial plans. Statistical analysis of the resulting large database of model runs identifies the combinations of uncertainties most important to distinguishing those futures in which the initial plan meets and misses its goals. This analysis informs the choice of policy-relevant scenarios that illuminate the vulnerabilities of the initial plan, suggest the most important signposts to monitor, and support the development of contingency plans. The process can then be repeated to stress-test the candidate robust and flexible plan over the many futures to identify any remaining vulnerabilities and potential contingency plans (Lempert et al. 2006). Current LTSs do embrace some key DMDU concepts. The German LTS, for instance, considers an initial plan to 2030 and offers a process and principles to guide subsequent plan adjustments. Many of the other LTSs use scenarios to explore alternative pathways and identify low-regret actions across all of them. While most LTSs focus on scenarios consistent with Paris goals, the Czech LTS also includes scenarios that are not consistent with the agreement, helping to identify actions important to meeting the goals. How might nations build on these initial steps to develop a more comprehensive and effective LTS? They might begin by crafting an initial plan. Such an initial LTS might include the actions in their current NDCs and the additional actions out to 2030 and to 2050 needed to meet the nation’s 2050 emission reduction and development goals in the already existing scenarios. Simulation models would then stress-test these plans over many thousands of futures (or more), each future consisting of different assumptions about future technical, socioeconomic, climatic, and other conditions going well beyond the existing scenarios. Simulation models used to support the development of current LTSs have already been used by researchers to conduct the many-thousands-of-futures type of DMDU analysis envisioned here (McJeon et al. 2011; Lamontagne et al. 2018). The set of futures used in these stress tests would be chosen to explore the possibility of both good and bad surprises. Statistical analysis of the resulting database of model runs would help identify a small number of policy-relevant scenarios that illuminate future conditions in which the initial plan may either prove insufficiently ambitious or fall short of its goals (Lempert 2013). Planners then identify (1) signposts to monitor that will indicate whether one of those scenarios is emerging and (2) contingency actions to take if the signposts are observed. They would use this information to craft a robust and flexible LTS. Nations might repeat the process, searching for any vulnerabilities of this new LTS and identifying any additional signposts and contingency actions. Figure 1 shows a notional example. Imagine a country has developed an initial LTS. DMDU analysis reveals that the plan’s success depends on two key assumptions: the future cost of low-carbon technologies and the future global price of fossil fuels. The figure’s left panel shows a scenario matrix with these two driving forces, with the assumptions underlying the initial LTS at the center. If the future unfolds as expected, the LTS will have the correct amount of ambition. If the future costs of low-carbon technologies are less than expected and the price of fossil fuels more, the draft LTS could be more ambitious. If the reverse is true, the LTS would prove insufficient. The figure’s right panel shows how the country might manage these uncertainties using an adaptive pathway. The LTS would begin with the current plan but would monitor the cost of low-carbon technologies and fossil fuel prices. If these trends pass predetermined thresholds consistent with the higher ambition scenario, the LTS could increase its ambition. If these trends pass predetermined thresholds consistent with the miss goals scenario, the LTS might add additional elements. 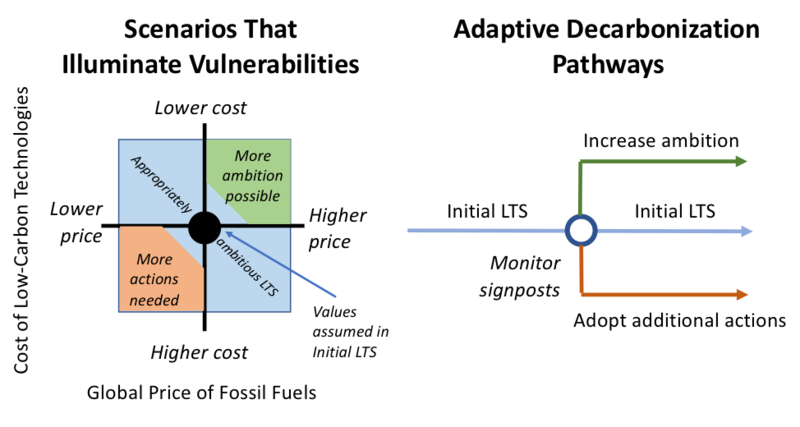 While not yet common among LTSs, such adaptive pathways are increasingly used by organizations adapting to climate change. For instance, adaptive pathways provide the foundation for the Netherlands Adaptive Delta Plan (Bloemen et al. 2018), the Thames River Barrier (Ranger et al. 2013), and the long-term water management plans for the U.S. Bureau of Reclamation (Groves et al. 2013) and the Metropolitan Water District of Southern California (Groves et al. 2014). Pathways are also part of the official sea-level-rise guidance documents from New Zealand (Ministry for the Environment 2017) and the state of California (California Ocean Protection Council 2018). Organizing an LTS as an adaptive pathway is certainly consistent with the Paris Agreement, which calls for updating NDCs every five years. The approach proposed here would more explicitly link the LTSs and NDCs by designed the former to anticipate change and adjust to it over time. In particular, an adaptive LTS would include explicit considerations of trends to monitor and actions that might be needed if those trends are observed. The anticipation of such monitoring and adjustments might inform the actions included in current NDCs. For instance, an adaptive LTS might encourage NDCs to include near-term shaping actions designed to generate low-probability, high-consequence options for future emission reductions. As noted, analytic methods and tools exist that can help stress test plans over many futures, organize the results into policy-relevant scenarios, and use these scenarios to craft adaptive pathways. The simulation models underlying current LTSs have already been used to conduct such DMDU analyses. In addition, understanding of these quantitative DMDU methods can enrich qualitative scenario approaches. For instance, stakeholder workshops can help identify scenarios that illuminate the vulnerabilities of a proposed LTS. As with the quantitative approaches, these scenarios can be used to identify contingency actions and signposts to monitor. Organizing LTSs as adaptive pathways presents a number of cognitive and institutional challenges, however. First, crafting a flexible and robust strategy requires more work than the use of a traditional approach to develop an LTS. Once they have settled on an LTS, planners still need to stress-test it over multiple scenarios, evaluate responses to each scenario, and identify the corresponding signposts. More challenging is the need for a new mindset. The analysts and planners who develop LTSs often vest their authority in an ability to make good predictions about the future. Organizing LTSs as adaptive pathways requires analysts and planners to admit that the future is largely unknown and lodge their authority in robust and flexible plans designed to perform well no matter what the future holds. Organizing LTSs as adaptive pathways requires policymakers to admit that there are plausible future conditions under which their current plans may fail and requires others to trust that the policymakers or their successors will adjust the plans in the future if needed. Overcoming these barriers can bring significant benefits. LTSs rooted in predict-then-act thinking may stumble over unexpected setbacks that robust and flexible plans may avoid. Perhaps even more important, robust and flexible plans can more actively seek to shape the future. Such plans can include high-risk, high-payoff actions that may not work but that could bring substantial benefits if they do. Such plans can also pursue “sticky” interventions, ones that start small but are designed to grow over time as they solidify political and economic support (Levin et al. 2012). Given the scale of the challenge in meeting the goals of the Paris Agreement, this ability to create new options and generate self-reinforcing policy responses may be the most important feature of robust and flexible LTSs. Bankes, S., W.E. Walker, and J.H. Kwakkel. 2013. “Exploratory Modeling and Analysis.” In Encyclopedia of Operations Research and Management Science, edited by S.I. Gass and M.C. Fu. Boston: Springer. Bloemen, P., M. Van Der Steen, and Z. Van Der Wal. 2018. “Designing a Century Ahead: Climate Change Adaptation in the Dutch Delta.” Policy and Society, September 18. California Ocean Protection Council. 2018. State of California Sea-Level Rise Guidance. http://www.opc.ca.gov/webmaster/ftp/pdf/agenda_items/20180314/Item3_Exhibit-A_OPC_SLR_Guidance-rd3.pdf. Clarke, L., K. Jiang, K. Amimoto, M. Babiker, G. Blanford, K. Fisher-Vanden, J.-C. Hourcade, V. Krey, E. Kriegler, A. Loschel, D. McCollum, S. Paltsev, S. Rose, P. Shukla, M. Tavoni, B. van der Zwaan, and D. van Vuuren. 2014. Assessing Transformation Pathways. Working Group III. Geneva: Intergovernmental Panel on Climate Change. Dasgupta, P., O. Edenhofer, A.M.A. Amezquita, A. Bento, S. Caney, D.D.l. Croix, A. Fosu, M. Jakob, M. Saam, K. Shrader-Frechette, J. Weyant, L. You, G.C. Delgado-Ramos, M.J. Dorsch, C. Flachsland, D. Klenert, R. Lempert, J. Leroux, K. Lessmann, J. Liu, L. Mattauch, C. Perrings, G. Schwerhoff, K. Seyboth, J. Steckel, J. A. Strefler, and K. Seyboth. 2018. “Economic Growth, Human Development, and Welfare.” In Rethinking Society for the 21st Century: Report of the International Panel on Social Progress, edited by International Panel on Social Progress, 141–86. Cambridge: Cambridge University Press. Dewar, J.A. 2002. Assumption-Based Planning: A Tool for Reducing Avoidable Surprises. Santa Monica, CA: Cambridge University Press. Groves, D.G., E. W. Bloom, R.J. Lempert, J.R. Fischbach, J. Nevills, and B. Goshi. 2014. “Developing Key Indicators for Adaptive Water Planning.” Journal of Water Resource Planning and Management 141 (7). doi: 10.1061/(ASCE)WR.1943-5452.0000471. Groves, D.G., J.R. Fischbach, E. Bloom, D. Knopman, and R. Keefe. 2013. Adapting to a Changing Colorado River: Making Future Water Deliveries More Reliable through Robust Management Strategies. RR-242-BOR. Santa Monica, CA: RAND Corporation. Haasnoot, M., J.H. Kwakkel, W.E. Walker, and J. ter Maat. 2013. “Dynamic Adaptive Policy Pathways: A New Method for Crafting Robust Decisions for a Deeply Uncertain World.” Global Environmental Change 23 (2): 485–98. Kalra, N., S. Hallegatte, R. Lempert, C. Brown, A. Fozzard, S. Gill, and A. Shah. 2014. Agreeing on Robust Decisions: New Process for Decision Making under Deep Uncertainty, WPS-6906. Washington, DC: World Bank. Keeney, R.L., and H. Raiffa. 1993. Decisions with Multiple Objectives. Cambridge: Cambridge University Press. Lamontagne, J.R., P.M. Reed, R. Link, K.V. Calvin, L.E. Clarke, and J.A. Edmonds. 2018. “Large Ensemble Analytic Framework for Consequence-Driven Discovery of Climate Change Scenarios.” Earth's Future 6 (3): 488–504. Lempert, R. 2013. “Scenarios That Illuminate Vulnerabilities and Robust Responses.” Climatic Change 117: 627–46. Lempert, R.J. 2008. “Can Scenarios Help Policymakers Be Both Bold and Careful?” In Blindside: How to Anticipate Forcing Events and Wild Cards in Global Politics, edited by F. Fukuyama. Washington, DC: Brookings Institution Press. Lempert, R.J., D.G. Groves, S.W. Popper, and S.C. Bankes. 2006. “A General, Analytic Method for Generating Robust Strategies and Narrative Scenarios.” Management Science 52 (4): 514–28. Lempert, R.J., S.W. Popper, and S.C. Bankes. 2003. Shaping the Next One Hundred Years: New Methods for Quantitative, Long-Term Policy Analysis. Santa Monica, CA: RAND Corporation. Levin, K., B. Cashore, S. Bernstein, and G. Auid. 2012. “Overcoming the Tragedy of Super Wicked Problems: Constraining Our Future Selves to Ameliorate Global Climate Change.” Policy Sciences 45: 123. McJeon, H.C., L. Clarke, P. Kyle, M. Wise, A. Hackbarth, B. Bryant, and R.J. Lempert. 2011. “Technology Interactions among Low-Carbon Energy Technologies: What Can We Learn from a Large Number of Scenarios?” Energy Economics 33: 619–31. Ministry for the Environment. 2017. Coastal Hazards and Climate Change: Guidance for Local Government. Wellington, New Zealand: Ministry for the Environment. http://www.mfe.govt.nz/publications/climate-change/coastal-hazards-and-climate-change-guidance-local-government. Popper, S.W., R.J. Lempert, and S.C. Bankes. 2005. “Shaping the Future.” Scientific American 292 (4): 66–71. Ranger, N., T. Reeder, and J.A. Lowe. 2013. EURO J Decis Process 1: 233. Trutnevyte, E., C. Guivarch, R. Lempert, and N. Strachan. 2016. “Reinvigorating the Scenario Technique to Expand Uncertainty Consideration.” Climatic Change 1–7. Weaver, C.P., R.J. Lempert, C. Brown, J.A. Hall, D. Revell, and D. Sarewitz. 2013. “Improving the Contribution of Climate Model Information to Decision Making: The Value and Demands of Robust Decision Frameworks.” WIREs Climate Change 4: 39–60.